F158 is a weighing controller that allows direct connection to the base module of OMRON’s general-purpose sequencer SYSMAC α. Since inter-equipment wiring is not required, weighing system construction time can be reduced with serviceability improved. With the power supply shared, drastic cost reductions can be achieved. ･ RUN: Lights when the unit is initialized. ･ CAL: Lights when a calibration error occurs and flashes when it is being calibrated. ･ OVR: Lights when the weight alarm status is ON. ･ CMD: Lights when a setting error occurs. Combination of MD0 to MD3 determines operation mode. ･ Calibration, setting method: Setting from setting remote console unit (C110, C120) or PLC. ･ Setting value protection: Setting operation can be locked to prevent unauthorized modifications of default values and calibration by malfunction (LOCK). 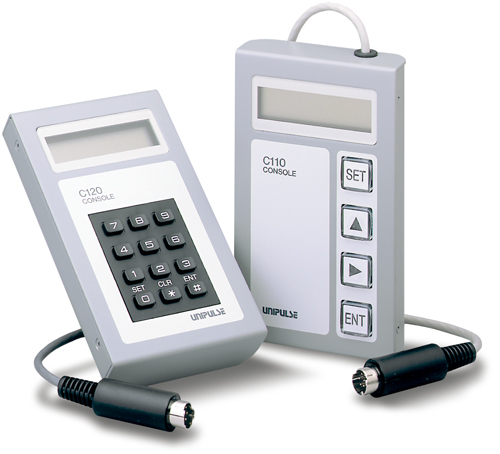 ･ C110 and C120 allows monitoring of gross weight, net weight and tare weight, change and registration of setting commands, and execution of all operation commands.